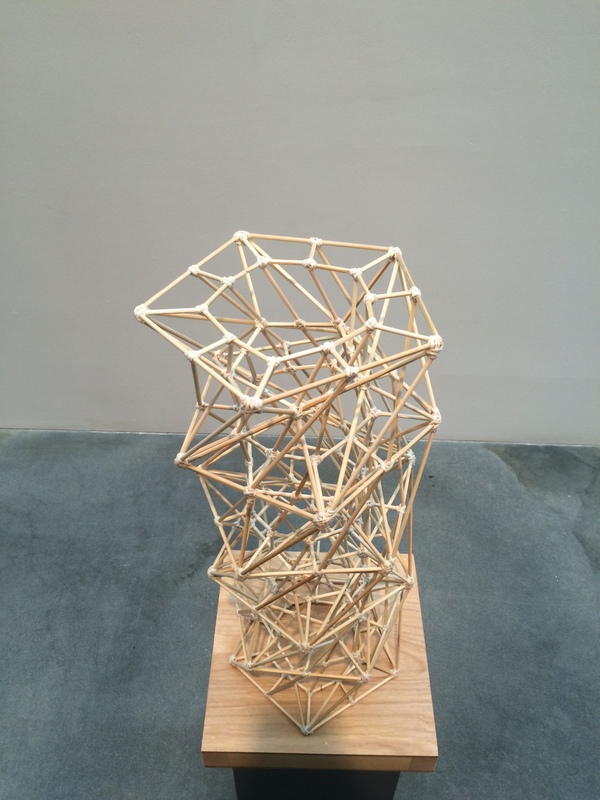 Pace Gallery on 25th street in Chelsea is currently presenting the geometric sculptures of James Siena. Well known for his algorithmic paintings, Siena has been making sculptures throughout his career. At first working with tooth picks, and now new work using bamboo skewers, as well as bronze casts of previous pieces. Some of the work has very clear geometric patterns and others seem more chaotic. I have chosen two of the bamboo sculptures that are about a particular mathematical geometric phenomenon. “Richard Feynman” from 2014 is a great illustration of self-similarity in three dimensions. Named after the famous 20th century Theoretical Physicist, this work is a cube within a cube within a cube. Each cube structure is composed of 4 by 4 by 4 cubes. Four of smallest cubes make up one cube in the medium cube structure and four of the medium cubes make up one of the large cubes on the large cube structure. 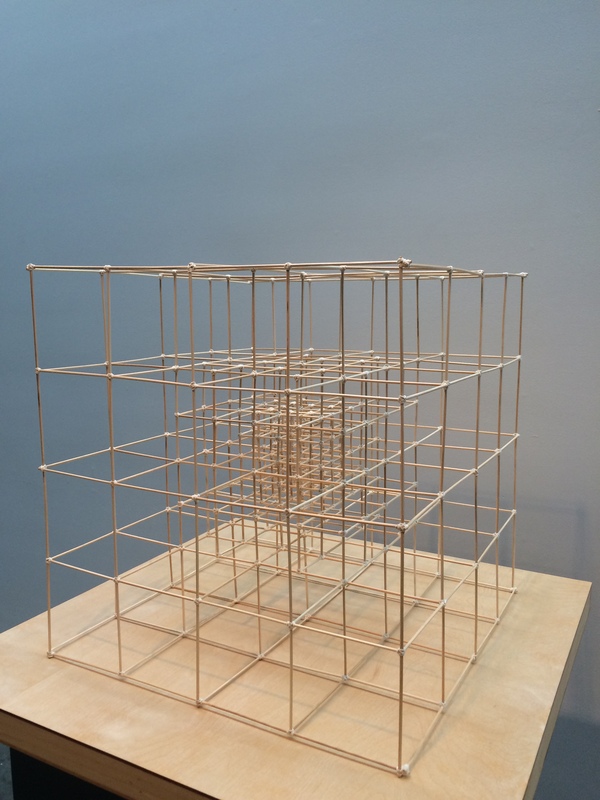 Using the bamboo skewers as lines in the 3-D space the artist has created grids on three different scales. “Morthanveld: Inspiral, Coalescence, Rungdown” from 2014-2015 is complex tower created using 6 regular pentagons. Instead of stacking them at the same angle, Siena has twisted each consecutive pentagon 36 degrees. The finished sculpture is a spiraling geometric column. Siena uses a building technique of wrapping string around the vertices to to attach the bamboo skewers both in the interior and the exterior shapes. This requires a a very hands on process adding a human element to the Mathematical subject matter.